Now... 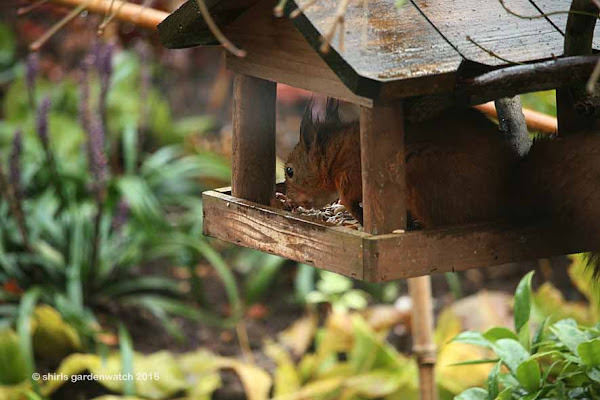 I can properly claim to having had our native red squirrel visit my garden! 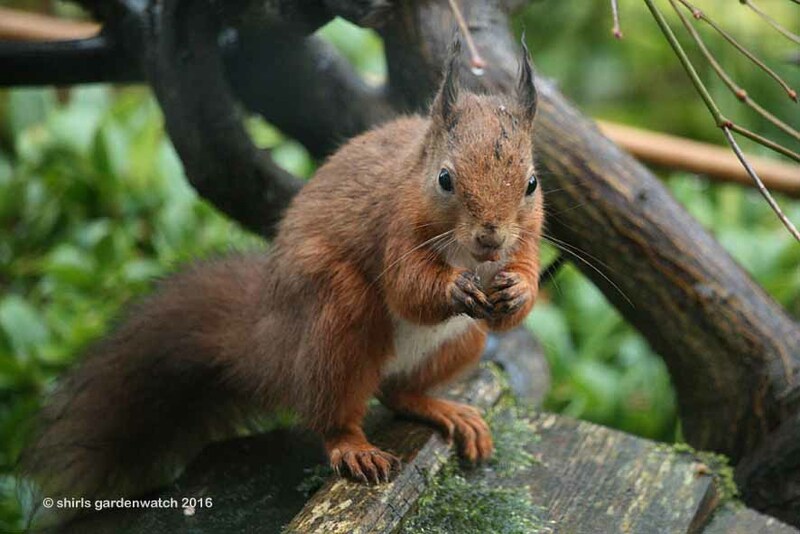 This is fantastic news and I’m hoping it indicates that the smaller charismatic red squirrel is recovering against the larger greys, whose arrival to the UK has led to it becoming seriously endangered. 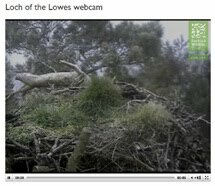 This could be evidence towards a positive future for this well loved wildlife species here in the UK. 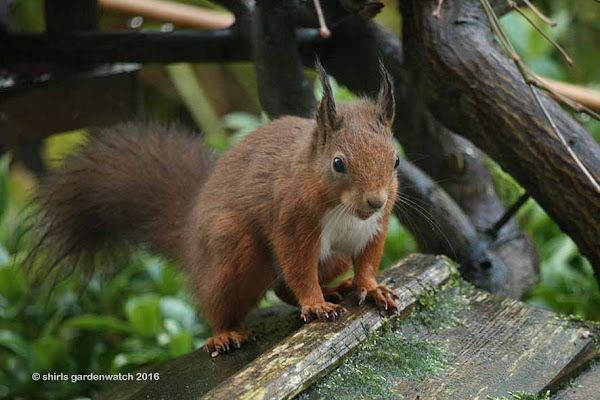 Growing up in a more northerly part of Perthshire, where the red squirrel was regularly seen at the time, this animal truly symbolises the wildlife of my childhood growing up in Scotland. 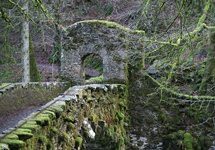 At the time it was just part of the landscape and I guess I took its presence for granted. Magnificent highland cows grazed in the fields over a busy main road opposite my house and red squirrels ran up trees and across the ground around them on my woodland walks. So here I am at the PC finishing breakfast and this post celebrating the return of the red squirrel and outside my window it is running back and forth taking nuts from the table. Just how magical is that! Oh dear, a magpie is on the house roof looking down at it... I wonder if it is a threat. 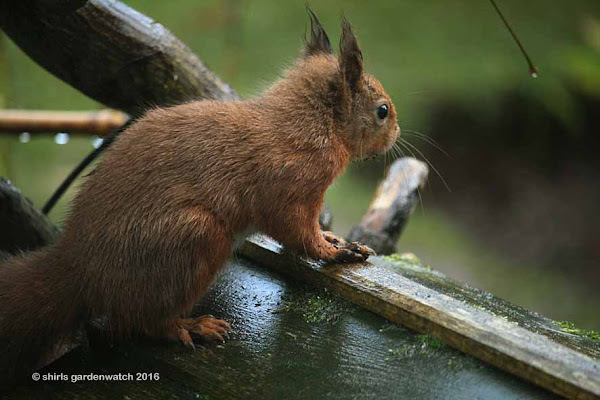 Gardenwatching the red squirrel is beginning in earnest now! Phew... it was the grated cheese I scattered on the ground beside the feeders last night that the Magpie was interested in. 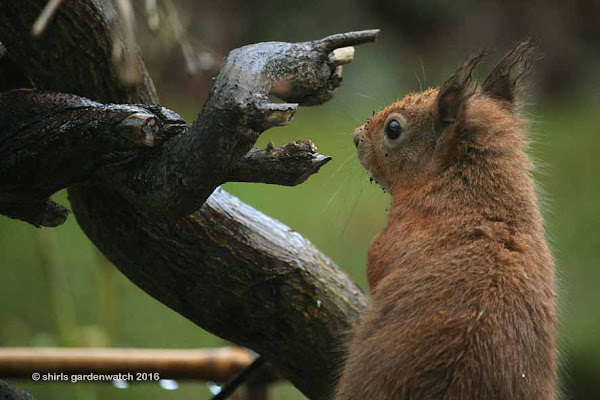 A blackbird appears to be making calls from a perch nearby as the red squirrel feeds on nuts. It is probably objecting to this new diner but it is standing its ground. 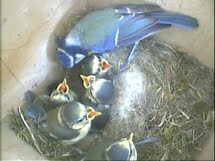 New garden arrivals are always closely watched by the regular visitors. Observing the hierarchy of garden visitors is always interesting for the indoors gardenwatcher to see too. Oh dear again, a white cat with black and grey markings has just wondered under my window - it looked huge and so slow after watching the tiny, speedy red squirrel. I'm slightly regretting opening the window and hissing at the cat to scare it away now. Hissing cats away from the ground feeders outside my window is something I do - it usually works too. Time for a tasty peanut break - caching winter stores of food is hungry work. Wow, really wow, ten years ago I could never have imagined that I would be contributing to statistics monitoring the numbers of red squirrels. Last night I added my sighting to the website Saving Scotland’s Red Squirrels where a map can be viewed on their distribution. 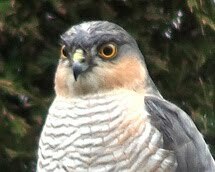 I didn't see many reported in my area so adding my sighting has real value here. 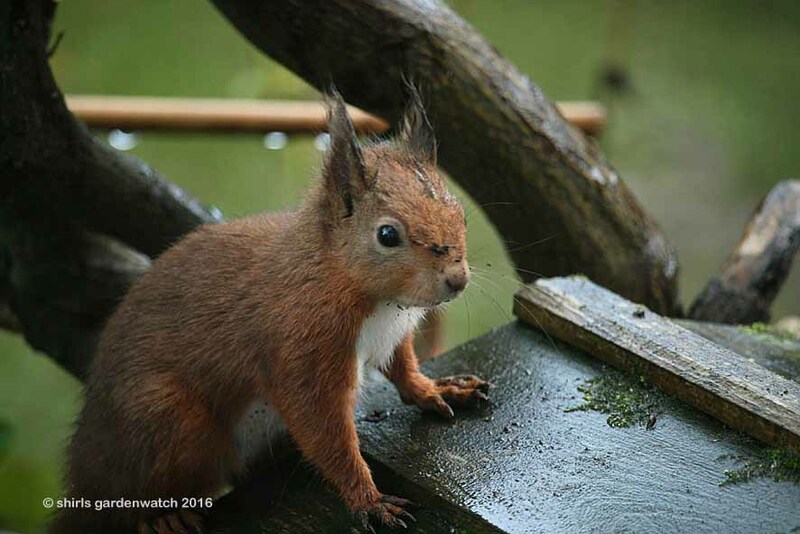 Should you ever see the red squirrel in your area of the UK, there will be conservation groups who will welcome logging your sightings so please report them. All the data we supply for species that are endangered does really make a difference in terms of its survival. You’ve got to keep alert in those busy garden borders! So, was yesterday's visitor the same red squirrel that was very briefly spotted 2 weeks ago? That, I can’t tell. However, I do suspect yesterday's visitor plans to return. How might I know this? Well, yesterday's visitor has been planting peanuts throughout my borders! It wasn’t a short visit either. 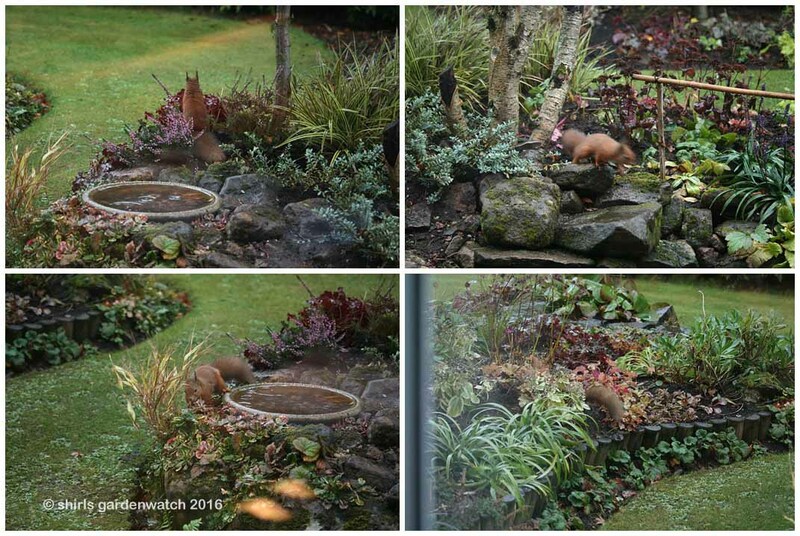 Yep, a red squirrel is caching food for winter in my garden… my garden!!! for a red squirrel new to the area. Getting clear photos was very tricky. Little did the red squirrel know that it was facing the direction of a feeder on a post especially put up for it. The pine tree was only a temp overnight location. 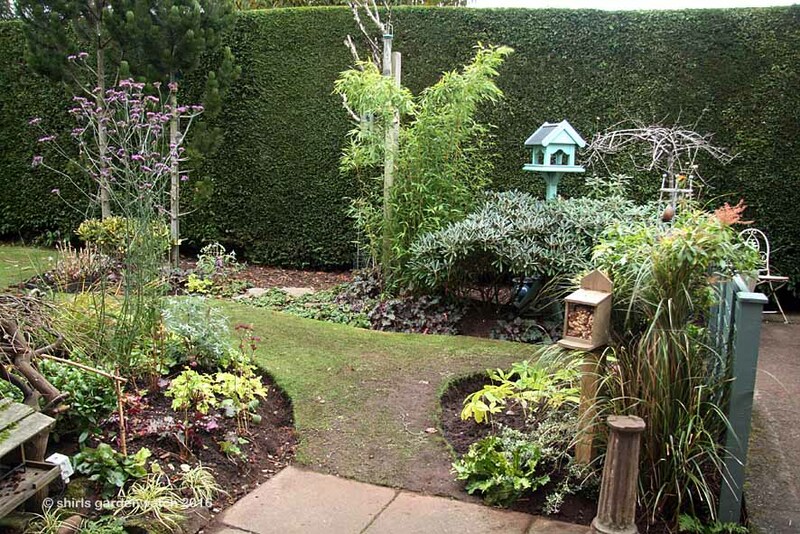 The bird table roof is bottom left, the squirrel feeder on the right with a bird bath pedestal sited as a possible perch.Muddy record photo after border replanting. Finally, that red squirrel didn’t half explore my garden and its borders yesterday. 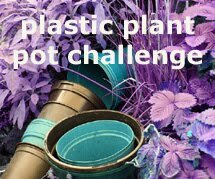 At one point it jumped from the potting shed roof straight across to the face of my leylandii hedge and ran up, down and across it before returning to the bird table. What an entertaining little acrobat it was! My favourite muddy face from yesterday. In contrast, snow is forecasted for today. 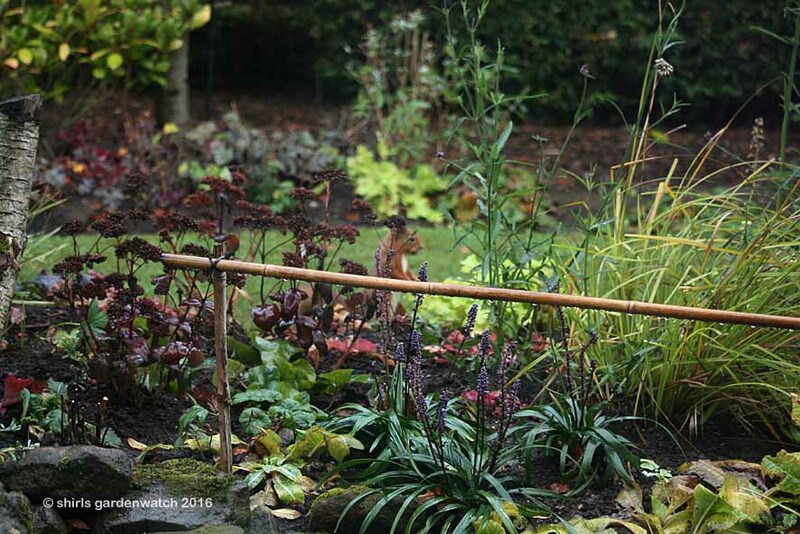 I wonder how the red squirrel will behave in a very busy garden. 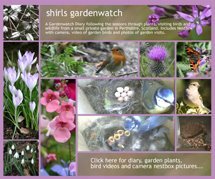 This post was published by Shirley for shirls gardenwatch in November 2016. Bravo for careful observation of red squirrels. I love her and very pretty picture. Regards. Don't you fret. That little red squirrel will find the peanuts. Squirrels love them. At least they do here. Of course I mostly get grey squirrels and an occasional Fox Squirrel. If ou find peanuts growing in your garden you can leave them and then harvest the peanuts for the squirrels again. I always think that is a lot of fun. Peanuts have a pretty little orange flower. Sunflowers will pop up all over your garden too. The squirrels here usually plant sunflowers in threes. They are quite the gardeners. Fantastic, and well done on getting some photos. They are such beautiful little creatures. Oh, what a gorgeous creature. 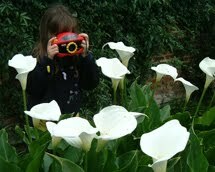 Brilliant photos Shirley. I wish we had reds here instead of the grey tree rats. Even better that you were able to add your sighting to the records. Here's looking forward to many reports of red mischief and maybe some video in the near future. John, it really is gorgeous and I hope I see it when we have snow (although not in a rush for that) so I can get photos then. My sighting is live now. Video record captured today! A flash of red brings back this blogger!